How to Make a Smoothie? It’s really pretty simple. Coconut smoothie recipes are delicious. Pick one out, below, throw your ingredients in a blender, and blend. I do advise you to add the ingredients in my recipes in the order listed, though. Why? If you add frozen berries first, they can melt just enough to clump and re-freeze together, and burn out the motor on your blender. So as a general rule, add liquids before chunky, frozen ingredients. For smoothies that use ice cubes or frozen berries, be sure you have a high quality blender. Even though we have a very good blender on our Bosch Mixer, we always use our Vita Mix to make smoothies. Below is one of the simplest coconut milk smoothie recipes, to get you started. These drinks are probably my favorite fat loss secret. I love smoothies that contain coconut milk, as the coconut oil is one of my top fat loss foods. They are a delicious way to help target fat loss, especially when you are doing regular fat loss workouts. We are pretty serious smoothie drinkers around here. We like to invent new, healthy recipes quite often. Some of us have food allergies. We have had to avoid dairy at times, so we have to be creative. And, or course, we like to use living, whole foods, to keep the fat loss natural. This, one of my very favorite smoothies, can contain as few as only three ingredients, and can be made no sweeteners at all, besides the fruit. This recipe is a great way to get sweets without a big spike in your blood sugar level! 14 ounces of fresh or canned coconut milk (it contains coconut oil, great for increasing your metabolism :). To avoid preservatives and BPA found in most brands of canned coconut milk, I recommend learning how to make coconut milk--it is easy with this coconut milk recipe! 1/2 teaspoon or more coconut oil (optional, you can add more over time if you want). Optional: Stevia, if you are limiting the amount of berries and want a sweeter taste. Add all ingredients to your Vita Mix or blender, and blend till thoroughly mixed. This makes about four smoothies, depending on your desired serving size. 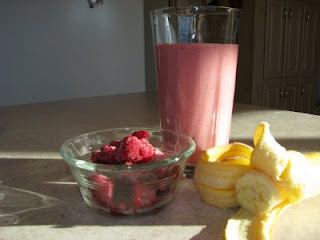 For another great recipe, check out my daughter's strawberry banana smoothie recipe. And be sure to sign up for my monthly newsletter, below, for more yummy GAPS Diet/SCD/Gluten Free recipes.